This week I’m in the interesting, yet nail-biting position of waiting for two agents to finish reading the full manuscript of Far From the Tree, having had two requests for a full within a week of one another. Needless to say, this is all enormously exciting, and, whatever the outcome of those calls, I feel very fortunate to have made it off the virtual slush pile and onto the desks of not one, but two agents. It gives me hope that I’m on the right track, and I just need to keep plugging away now until someone in the business decides I’m worth taking a punt on :). The timeframe for these things is quite fluid, so I’m trying to pace myself and not get too het up about the whole process. I should imagine, though, that if either agency comes back to me with a ‘Yes’, you’ll be able to hear me screaming from the rooftops regardless of how far away you live from me ;). While I’m awaiting a decision from them both, I’m trying not to obsessively check my email, phone, landline, twitter feed, runes etc, and trying gamely to focus on other things. Since Sweeter than Cider is at a stage where I need a good chunk of time to get to grips with the structure, that will have to wait until next Tuesday when I get a long anticipated chunk of CFT (Child-Free Time) to work on it. In the meantime, I’ve been looking at many pretty things, and trying to make some, too. Pretty Thing #1 – Far From the Tree word clouds I’ve always loved word clouds, ever since I discovered them as part of my job. Basically, they’re easier to look at than explain, so here’s the one I made from the detailed synopsis of Far From the Tree. The idea is that, the more you use a word in a piece of text, the bigger that word appears in the cloud. There aren’t many surprises for me in this one, although I hadn’t realised just how powerful the parenting narrative is in the synopsis – I do now!! Here’s one I did for one of the ‘fruitier’ scenes of the novel: I do love that ‘Alright’ features prominently in this one – it’s such a key feature of West Country dialogue ;). 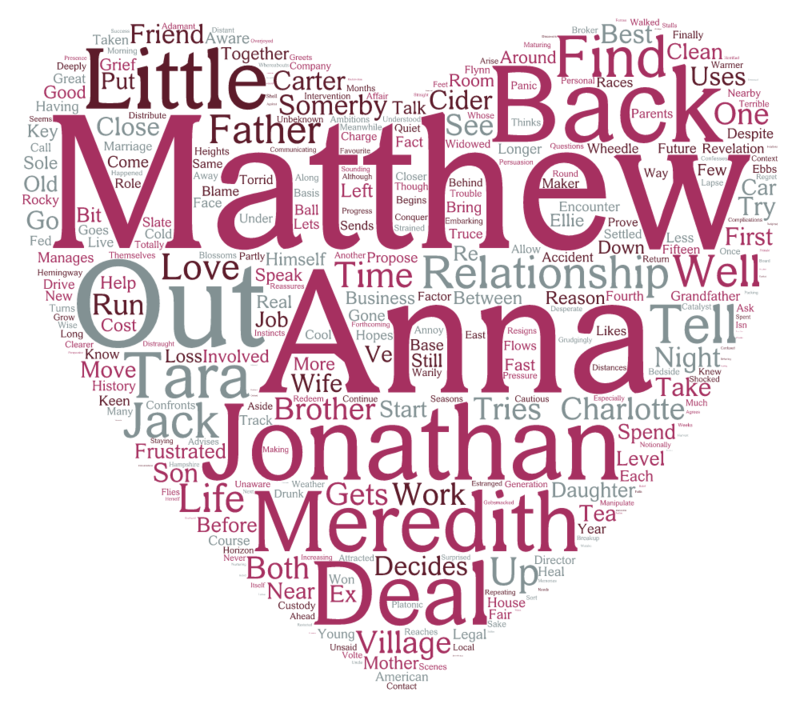 Pretty Thing #2 – Poldark I thought I’d jump on the bandwagon (or should that be on the back of a black stallion?!) and post a little addendum to my previous blog entry about alpha males. It was brought to my attention that I’d left out a super worthy, and super current example of this trend in action; that, of course, of Ross Poldark. Or, at least, the most current incarnation of the character on the BBC, Aidan Turner. My lovely mother-in-law-in-law alerted me to this fab song, which obviously shares the same name as my novel. Folky, edgy and all round fantastic, it would be great on the soundtrack to the film of my book, one day 😉 So that’s it for now. The challenge will be to find even more pretty things over the coming days and weeks to stop the nail biting!! This entry was posted in Uncategorized and tagged aidan turner, far from the tree, music, poldark, word clouds, writing. Bookmark the permalink. ← The rise of the ‘Alpha Wave’; is Mr Darcy coming back?